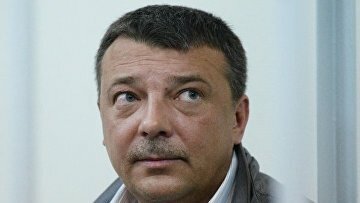 New corruption charges brought against convicted ex-investigator Maksimenko | Russian Legal Information Agency (RAPSI). MOSCOW, August 10 (RAPSI) – Ex-chief of the Russian Investigative Committee’s Internal Security Directorate Mikhail Maksimenko sentenced to 13 years in prison for corruption has been charged with another count of bribe taking, prosecutor Igor Potapov has told RAPSI. According to the prosecutor, Maksimenko has organized a criminal group involving ex-First Deputy Head of the Investigative Committee’s Moscow Directorate, General Denis Nikandrov, ex-director of the Investigative Committee's Main Investigations Directorate, General Alexander Drymanov and ex-chief of a Moscow directorate of the Investigative Committee Aleksey Kramarenko. The accomplices received $1 million in bribes for assistance in release of two defendants in a case over shooting in central Moscow, Potapov said. On April 20, Maksimenko was found guilty of taking two bribes. In addition to the prison term the defendant was fined 165 million rubles ($2.8 million). He was also stripped of his colonel of justice rank and prohibited from holding public posts for 3 years. According to prosecutors, in 2016, Maksimenko and his accomplice received $500,000 bribe for help with one of criminal cases. He is also charged with taking $50,000 bribe in 2015 for organizing unlawful criminal prosecution of law enforcement officers in the interests of a bribe-giver. The defendant has been arrested along with other high-ranking investigators, his former deputy Alexander Lamonov and Nikandrov. The three officers were charged with taking €500,000 from alleged gang leader Zakhariy Kalashov, who was sentenced to 9 years and 10 months in a high security penal colony on March 29.